Can the Prisoner's Dilemma be solved with a civil contract? 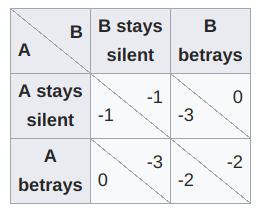 The Prisoner's Dilemma is a well-known game theory problem that translates well into our real life experience. The idea is that two people who will optimize their individual and collective outcomes by cooperating can, under specific circumstances, decide not to cooperate. Can the two prisoners solve their dilemma by mutually binding each other to silence with an enforceable civil contract of the nature of a Non-Disclosure Agreement? If A and B both remain silent, both of them will only serve one year in prison (on the lesser charge). A bargain, performance of which would tend to harm third persons by deceiving them as to material facts, or by defrauding them, or without justification by other means is illegal. But I do not think that analysis applies because there is no deception or fraud involved. Both parties have a fifth amendment right to not self-incriminate. The agreement would be for both parties to exercise their constitutionally protected rights by remaining silent. Prosecutors often solve this with immunity agreements for "unindicted co-conspirators" plus subpoenas to compel testimony and otherwise cooperation with investigation. However, I don't think that tactic can displace an individual's constitutionally protected right to "remain silent." [t]he power of the federal courts to enforce the terms of private agreements is at all times exercised subject to the restrictions and limitations of the public policy of the United States . . . . Where the enforcement of private agreements would be violative of that policy, it is the obligation of courts to refrain from such exertions of judicial power. it is obvious that agreements to conceal information relevant to commission of crime have very little to recommend them from the standpoint of public policy. [a] bargain in which either a promised performance or the consideration for a promise is concealing or compounding a crime or alleged crime is illegal. Not a bad question but a contract would change the outcomes of the prisoners dilema more than it would the nash equillibrium directly, at which point would it still be the prisoners dilema? Looking past this existential conundrum, economic analysis would show that to change the equilibrium, the contract would probably have to be at least as harsh as 2 or 3 years in prison for talking or provide a reward worth 2-3 years in prison to work (I say "probably" because were talking about human behavior) and be enforceable. Enforcability is your bigger issue and a bit hard to answer yes or no. As D M's answer explains, courts will likely not uphold a contract that goes against the public policy. There is also the issue of whistle-blower statues that protect people from retaliation for bringing crimes to light. On the other hand current events have shown that you can buy silence in cases of sexual harrasment, so it's not outlandish to think in certain circumstances paying off a witness is legal and enforceable but certainly rare. That said to some extent this is what happens with gangs and cartels in the real world. There is a contract. i.e. You forbear from testifying and I will forbear from causing harm to you and everyone you love. I don't think the word "civil" is the best word for this case, and it would not be enforceable in a court of law, but still technically a contract, and usually people making these kinds of contracts operate outside the law. When can an NDA be legally broken? Does an illegal clause create liability, or just invalidate the contract? Is there a name for the part of a contract that specifically deals with how the contract is to be interpreted? Can I terminate my contract with a building contractor? Can a contract remain in effect after it is terminated? Can you reuse the text of a contract you've signed with one party with another party? Does a contract modification need all the elements of a contract? Is a term stating the contract can only be changed in writing, valid?